Rosie Phillips Davis, Ph.D. ABPP, is the former Vice President for Student Affairs and current Professor of Counseling Psychology at the University of Memphis. She earned a doctorate in Counseling Psychology from The Ohio State University. She currently serves as President for the American Psychological Association. 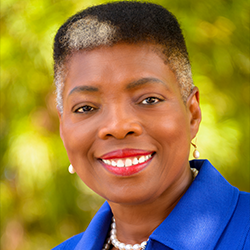 Dr. Phillips Davis previously served on the American Psychological Association Board of Directors and is past President of the Society of Counseling Psychology. She has served on the editorial boards of several journals, including current service on the Journal of Career Assessment, and is the author of numerous articles and book chapters on career counseling and has co-edited two books. She is a co-founder of the National Multicultural Conference and Summit. She works with poverty in the Memphis community and is a founding member of the Women’s Foundation for a Greater Memphis, whose mission is to help women and children reach their full potential. They work to help women reach economic sufficiency because she believes that if you help a woman, you help her family.